The bearer of this wand harnesses a tremendous amount of power, all of which is funneled into a hatred for gourds. This includes, but is not limited to, watermelons, pumpkins, cantaloupes, honeydews, and squash. Flicking this wand at a gourd will cause it to explode. 1. Destroy a single gourd, up to three times. 2. Destroy all the gourds in a five by five foot cube, one time. To cast, the target gourd or gourds must be mostly visible and within 45 feet. Sentient gourds must succeed on a wisdom saving throw of 13 or take 2d8 face explosion damage. Legendary Action: Gallagher’s Wrath – Target a single gourd within 45 feet and that gourd explodes. At the same time, every gourd within ten feet of that gourd explodes. The chain continues until there are no more gourds within ten feet of any other gourds. After using this legendary action, the wand shatters. Depending on the amount of gourds obliterated, the Gallagher’s spirit may appear before you and offer thanks or spite. 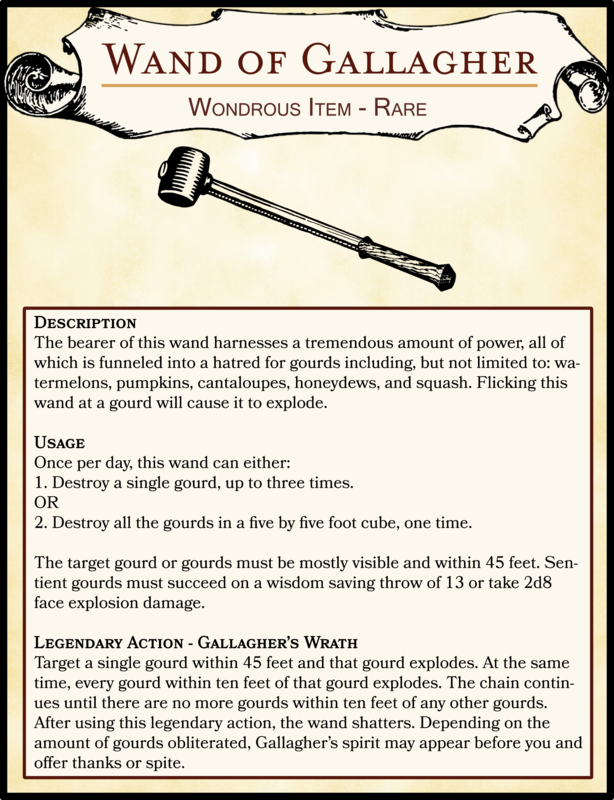 [For GMs – Spoilers] If players destroy enough gourds, the spirit of Gallagher appears and awards them Gallagher’s Warhammer which has a 5% chance of doing an additional 4d10 Face Exploding damage. If they don’t destroy enough, the spirit appears and attacks the players, dropping the warhammer if it’s defeated. The spirit shouldn’t be a terribly difficult fight, but if the players just used the legendary action, some guards or townsfolk may be alerted and join in the fight.